At the tail end of my 2 1/2 week excursion to East Asia, I ended up spending two nights in the South Korean capital of Seoul before catching my Korean Air flight back to New York. Earlier in the trip, Thailand and Singapore had already become the latest additions to my World Karaoke Tour; and while my intervening time in Cambodia had been disappointingly bereft of karaoke, I hoped that in Seoul I could finally increase the count of countries in which I’ve sung to 38. Happily, I did find one Western-style establishment that provides the opportunity to sing in public on a stage; and one is all that I needed. 🙂 The name of the place that I was so happy to discover is the Humming Live Bar; and its proprietor, Jessie Kim, was very welcoming and friendly (and I have since become Facebook friends with him). A unique feature of his karaoke shows is that he plays a keyboard instrument to back up the singers (but you still get the regular background instrumentation and the words changing colour on the monitor to help you, the singer, keep up with the timing of the song). And that is how, on January 9, 2015, South Korea (known officially as the Republic of Korea) became the 38th country on my World Karaoke Tour. I’ve now performed that song on four continents! (I’ve also sung it in Rio de Janeiro, Casablanca, and of course New York.) By the by, I’m grateful to Jessie’s wife, who helps run the bar, for her outstanding work behind the camera on this video. And I apologize for neglecting to write down her name for my records. 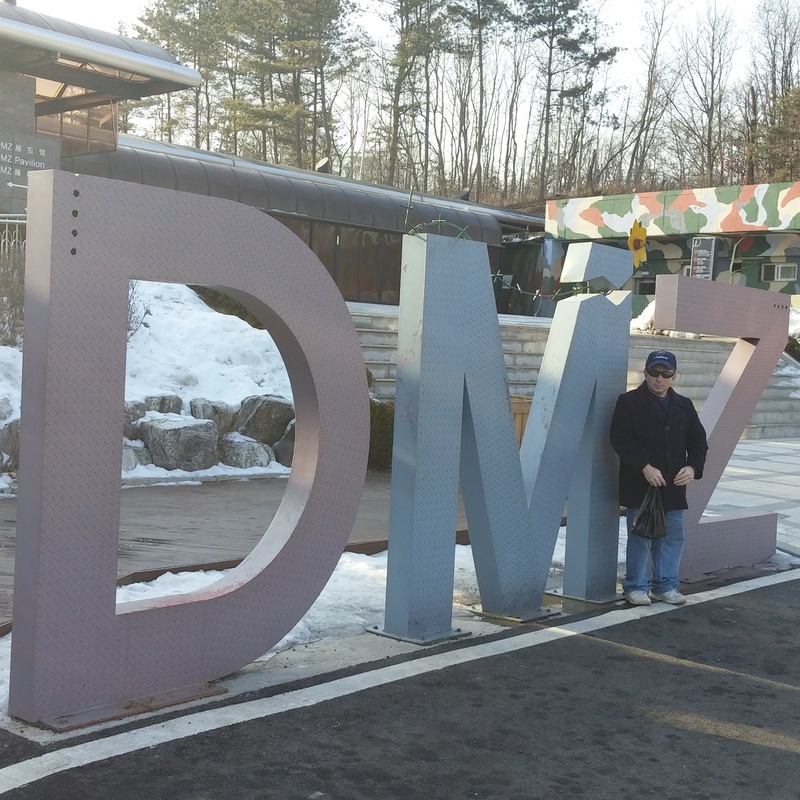 In addition to karaoke, the other principal highlight of my relatively brief stay in Seoul was a day-trip to the Demilitarized Zone (DMZ) that separates the Republic of Korea from North Korea. Among my tour group’s activities in the DMZ: We watched a short film about its history, including an overview of the Korean War that led to the creation of the zone. We also walked through one of the so-called “infiltration” tunnels that the North Koreans had dug underground in an apparent attempt to enable a surprise attack on Seoul from below. 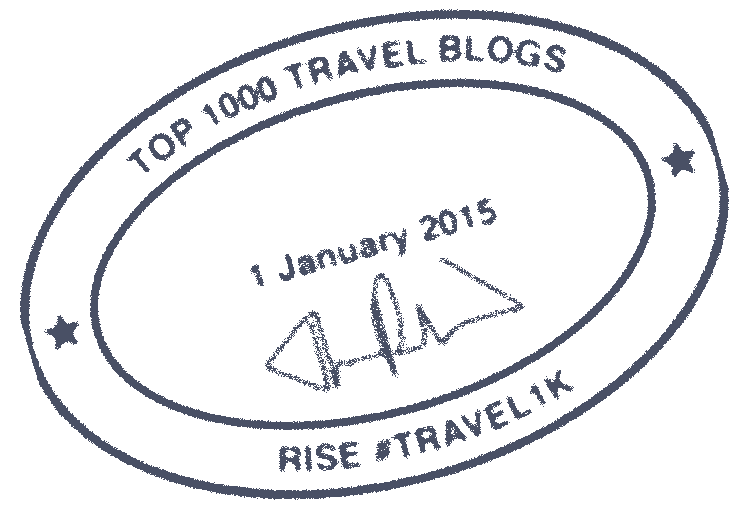 (There are believed to be a total of 24 such tunnels, although only four have been found to date.) The one that I strolled through, known as the Third Tunnel of Aggression, penetrates into South Korea within 44 km of Seoul. We also stood at a scenic lookout area and gazed into North Korea through coin-operated binoculars, viewing some of the Norks’ more prominent landmarks. Due to the brevity of my stay in Seoul, I saw almost nothing of the city itself. I hope that I’ll be blessed with the chance to return at some point and to explore Seoul and its surrounding environs, as I’ve heard great things about the area. In the realm of my karaoke-related travels, next up is a visit to China and Taiwan in late May through early June. (I already consider China as having been one of the countries in which I’ve performed on my World Karaoke Tour, as I’ve sung in its territories of Hong Kong and Macau; but this will be my first time in mainland China.) North Korea itself was originally intended to be a part of that trip as well, but that segment of the trip appears to have fallen through. That leaves a gap of a few days in my travel dates; if I don’t move up the date of my return flight to New York from Beijing, I’ll either opt to see more of China (perhaps adding a stay in Shanghai to the visits to Beijing and Xi’an that were already on my agenda) or substitute a still-to-be-determined Asian nation that is relatively nearby, such as Mongolia or the Philippines. In recent years, I’ve tended to plan out my journeys well in advance. My upcoming jaunt will feature more spontaneity, or at least last-minute planning, than is customary for me (I may not even make the arrangements for the final leg of this trip until I’m already in Beijing, although doing so may preclude me from selecting a country such as Myanmar that requires entry visas for tourists). Regardless of the ultimate decision that I make, I’m looking forward to some unpredictable new adventures this spring! 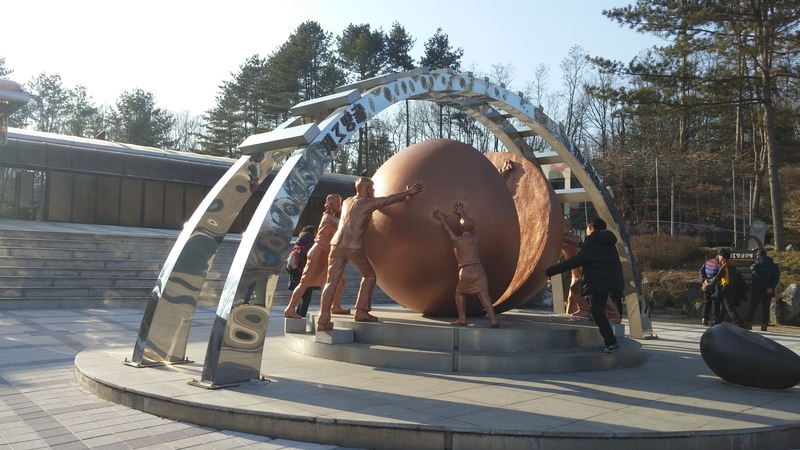 A sculpture outside one of the infiltration tunnels in the DMZ. Would you like to visit South Korea?